It's been a while since I had the chance and desire to work on this project. But summer is back and my interest in it too. Most general aspect of the project are done. But a lot of structures and scenery are left to be done. As a matter of fact, the big let down for me is the concrete pads color. Their bluish gay hue doesn't look very convincing to me. The contrast with the dirty soil around them is far too stark to be credible. According to old pictures, the concrete pads were quite light in color, but no bluish at all. Much more a light tan. Before moving on with scenery, I'm seriously thinking about repainting the whole thing with a more natural tone. It means a LOT of masking in perspective. When done, it should be similar to the concrete retaining walls on the perimeter. 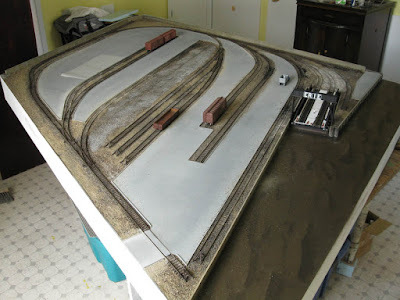 On a positive note, we will soon implement DCC on the layout. Since I started the project last summer, no train ever ran on it! Glad you are back to it! I'm just getting ready to start some scenery this summer on my Harlem Station, so I look forward to hearing more of your thoughts. Hi Riley! Battery power would indeed be the best option. Yesterday we had the first operation session using an old DC power pack. It was OK, but definitely not a long term option. I've got many structures to build and lots of scenery. Good luck with your project! BTW, this is truly a fun layout to operate.